An article appeared in The Progress newspaper in New Jersey about FIRST member Jolie C. and her efforts for the foundation and ichthyosis research. This is a great example of how one person really can make a difference! Below is the article as it appeared. By RITA ANNAN-BRADY, Staff Writer Published: Mar 4, 2010 ROSELAND - While for the past year the focus of the country has been on much needed healthcare reform, one local family has particular reason to be concerned about insurance coverage. In July 2007, Portia, daughter of borough residents Jolie and Sean, was born in Morristown Memorial Hospital. But the happy event was tinged with difficulty. "My OB [obstetrician] noticed that something was wrong with her skin at the time of birth," Jolie said. While the newborn was being checked out in the nursery, the pediatricians noticed that the baby's skin seemed to be shedding and was bright red. Baby Portia was taken to the neonatal intensive-care unit (NICU) for further evaluation. There she was kept in a temperature and moisture-controlled incubator. The baffled doctors kept her skin coated with Eucerin® and Aquaphor® and treated her like a burn victim, Jolie explained. "I didn't get to hold my sweet baby until the second day," she said. 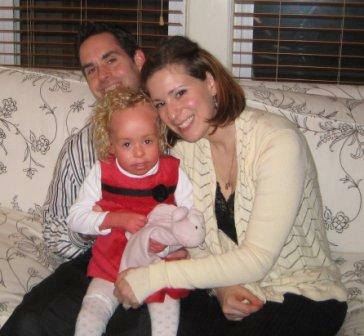 When doctors at Morristown Memorial could not identify Portia's condition after eight days in the NICU, the parents took their newborn to New York University Medical Center in New York City where she diagnosed with ichthyosis, a genetic skin disease characterized by dry, cracked, thickened and scaling skin. The diagnosis was confirmed by a biopsy performed by Dr. Albert Yan, a leader in the field of pediatric dermatology at Children's Hospital in Philadelphia. In December 2009, the state of New Jersey passed bill SCR129 memorializing the United States Congress to support increased funding for medical research for ichthyosis. We are asking our members from every state to contact your local state senators and representatives to ask them to bring a similar bill to the floor in your state. With multiple states participating, our voice will be louder at the National level. To locate your state representatives, CLICK HERE. This will bring you to The National Conference of State Legislatures website. To print out a sample letter to use in your correspondence, CLICK HERE. Codey Steps In More than a year later, a chance meeting with former Gov. and state Sen. Richard Codey, D-Essex, has led to action by the state Legislature in an effort to draw attention to and get help for those suffering from this relatively rare condition. Jolie and the governor met on a plane coming back home from Chicago in August 2008. They began talking after some confusion about who was sitting in whose seat, and they found out they both lived in Roseland, where the governor had just moved. They enjoyed some pleasant conversation during the flight but it was not until they were about to land that Codey told Jolie who he was. It was then that she told him her story and got his interest in the subject. As a result of what he has learned, Codey and fellow Democrat, Assemblyman John McKeon, D-Essex, cosponsored a resolution calling on Congress to support increased funding for medical research for ichthyosis. In December 2009, the state passed a bill memorializing the resolution. The bill was signed by Gov. Jon Corzine just before he left office in January. In a telephone interview, earlier this month, Codey explained his reasons for taking this action. "When someone has a rare disease, the pharmaceutical companies don't see a profit in it," Codey said. "So we need the federal government to give them money to work on the research for cures for these diseases which affect few families," Codey said. "It's not like breast cancer or prostate cancer where everyone wants to find a cure because it means millions and millions of billions of dollars in profits. So that's why we have to go this route." Despite the present economic climate, Sen. Codey said he still thinks the chances of getting federal funding are good. Managing The Disease At present there is no cure for ichthyosis, only treatment which is intensive and very time consuming. "That's why it's important to raise awareness for ichthyosis," said Jolie. There are at least 28 varieties of ichthyosis, she says, with a wide range of severity and symptoms. Some forms are hereditary or it may be acquired later in life as a result of internal disease or the use of certain medications. Portia has non-bullous congenital ichthyosifiorm erythroderma (NBCIE), which, according to FIRST (Foundation for Ichthyosis & Relation Skin Types,IncTM), has an incidence of 1 in 100,000. "In general, the top layer of her skin is impaired," said Jolie. "Ichthyotic skin reproduces faster than normal skin and the cells stick together forming plates and scales. With this quick skin turnover, Portia loses a lot of water and when the scales are not quickly removed, she can have trouble sweating and can easily overheat." Like many suffering from the disease, Portia has a harder time regulating her body temperature. People with ichthyosis are often more sensitive to temperature changes, both hot and cold. Overheating causes the biggest problem because of the problems with perspiration. Controlling the symptoms is difficult. Patients spend hours every week bathing and scrubbing to remove the scales as well as putting on creams to help moisturize and exfoliate. "In addition to prescriptive topical creams - and sometimes Accutane® taken orally - those with ichthyosis use a lot of over-the-counter products - creams, oils, ointments, shampoos, etc. - to treat the condition, all of which are not covered by private insurance" says Jolie. It's an expensive proposition. "As you can imagine, this can add up to quite a monthly and yearly expenditure," she said. The family had looked into getting assistance from the state for these products from Medicare or disability, as they are medically necessary for their daughter, but found they did not qualify based on household income. "We have already maxed out my husband's Flexible Spending Account which was the only avenue left open to us. Pressure on insurance companies to cover these special needs will really make a difference in patients' lives," she said. Advocacy After their baby was diagnosed, Jolie and Sean searched the Internet for information on ichthyosis where they came upon FIRST's web site. They joined the organization immediately and attended the national conference in Chicago in 2008 where they met other families with the disease including some in New Jersey. "We learned that the condition is so rare that there are only two babies born with it in the state a year," Jolie said. They also work locally on awareness and fund-raisers for the group. In December 2008, Sen. Codey joined them at a fundraiser in Roseland for Pancakes with Santa which benefited FIRST They also hosted a wine tasting in October for Ichthyosis Awareness Month and plan another this year. The family expressed their appreciation for the help from Sen. Codey. "We are very grateful that Sen. Codey has worked with us as an advocate to help with our fight to raise awareness," Jolie said. "So many times it feels like politicians are out of touch with the constituents. From our experience with Sen. Codey, he is not like that. The bill he has sponsored and helped to pass we hope will drive other states to do the same and in the end raise awareness and understanding for this disease and support from the community and insurance carriers." Codey said the family has his full support. "And they're a joy to work with," he said. Used by permission of Recorder Community Newspapers.